Scott Smulders of the Beursfoon KTM team scored his second podium finish of the Open Dutch Championship series this season. Smulders finished second in both heats for second overall, Kay de Wolf won the first heat, but the wheel of his bike collapsed on the sighting lap of the second race, which held him to 36th in that race. Kay is the series leader though. Sem Beijer fought hard for 22nd and 17th in his heats despite setbacks. Initially there was doubt if the event would continue, due to snowfall in the region on the night before the event. The organisers worked like titans to fix the track, and despite the track still being frozen in the morning, the riders set off for their qualifying session. Kay was very visible in his bright Fox gear, and he posted the pole time in his group, and also the fastest overall time. Scott in turn posted the fastest time in his group, which meant he had the second choice of gate. Sem qualified eighth in his group, and the Eurol-lubricated bikes of the team to all three riders to strong qualifying spots. The first heat started with a setback for Sem, because he crashed right off the start, and had to set in the chase from the back of the pack. He cut through the field, and eventually finished 22nd. Scott and Kay occupied the first two spots on their Hannamax machines and were initially involved in a strong tussle. Eventually Kay took the honours with Scott second. During the sighting lap for race two, an unusual setback befell Kay. On a long jump, some of his spokes broke, and the wheel was not strong enough for full speed racing. Kay decided to try and get as many points as possible nonetheless, riding at safe speed. Alas, better than 36th was not to be under the circumstances. Scott pilotes his HNR tuned KTM to second off the start. He set in the attack and took over the lead. He held that for a number of laps, but came to grief when they came across some lappers. A lapped rider stalled in front of him, and because he was in a rut, he could not avoid the rider, and had to see his lead disappear. He finished second again. Sem had another crash in this race, but finished 17th this time round. Scott was second overall on the day, Kay 12th and Sem 18th. 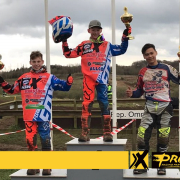 With the first two races of the Open Dutch Series gone, all three the team’s riders have qualified for the Dutch Masters of Motocross series. They have also achieved their goals of getting through the first two events on frozen tracks without injury. Team owner John Beijer is very happy with the state of affairs, and especially now that the race bikes and – parts have arrived for the Dutch Masters of Motocross, which will be set up in the coming week.